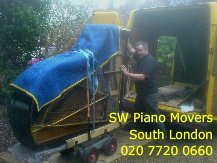 SW Piano Movers move upright pianos both locally and across the UK. 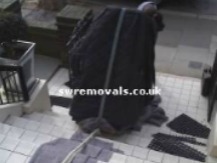 We are based in Upper Norwood, South London. circumstances, but the most important stage in piano moving is to 'walk the course', to plan the manoeuvres, and anticipate problems before starting work. It is the planning which makes moving a piano look easy. The moving assessment should start before you even obtain the piano: All too often it is assumed that the piece will fit through a doorway, round a turn or up a stairway, when in fact it cannot. 1) Old upright pianos can have seized castors whichan tear carpet and scratch floors. Even good castors will dent or scratch wooden floors, and should be used only to help you get the piano away from the wall. 2) Remove nearby furniture and ornaments to allow plenty of working room. 3) Consider removing the desk (where the music sheets sit), the key cover and the bottom panel under the key board. Often old upright pianos have dowels or fittings missing which may cause pieces to fall off the piano in transit. At the very least, you will by removing them, inspect them for security. 4) When manoeuvring out of a room into a tight corridor, the piano may need to be turned onto it's side. This risks damaging the finish to the side and if the lid overlaps the side, serious damage can be caused by the stress of pushing on it. The danger is all about failing to foresee these dangers, and so failing to protect the piano from them. 5) Pictures should be removed from walls if there is any risk of them being brushed by the handlers. 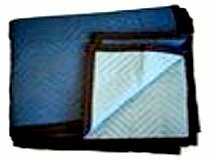 6) Door knobs and door mats are possible obstructions which may require removing. 7) Doorsteps and thresholds should be inspected to determine if ramps will be required. Wooden thresholds may have deteriorated. 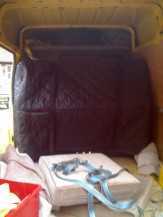 Aluminium and plastic thresholds (especially for sliding doors) may be damaged by the weight of a piano, and contact should be avoided. 8) Pathways can be uneven or pot-holed, and a piano on a trolley will exaggerate any deformity, possibly leading to complete loss of balance. Boards should be considered to smooth the way. 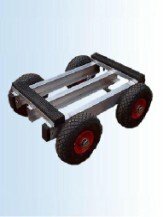 Keep to pathways and consider the use of boards to traverse grass or gravel. Here is a video of us moving a piano up three floors with tight stairs.